On March 11, 2011 a wall of water, reaching 130 ft high in places, struck the Japanese coast causing extraordinary devastation, including nd extensive damage to the Fukashima nuclear power plant. Should we blame this disaster on global warming? 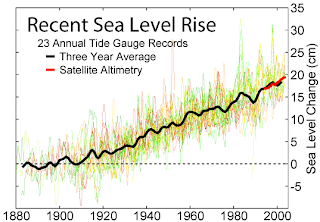 Certainly, the warming of the earth, caused by both natural and greenhouse gas forcing, has caused sea level to rise, with increases of about 10 cm (4 inches) since 1970, roughly when human greenhouse gas forcing became significant. The answer to the question above is clear: human-caused greenhouse warming may have added a few inches to the height of the water surface, but the great tsunami was caused by an extraordinary natural phenomenon (the Tohoku earthquake), and the impact of sea level rise was really in the noise level. The reason I mention this example, is that a number of folks are twisting essentially the same situation, but in the atmosphere, to make the case that global warming is making the weather more extreme. They cite the latest weather/climate disasters as proof: the current heat wave/drought in the Midwest, the Russian Heat Wave of 2010, the Hurricane Katrina in 2005, the list is endless. And headline-thirsty media are happy to amplify this message, to the detriment of their readership. We often show the upper-level flow patterns by displaying the height of pressure surfaces in the atmosphere, often 500 hPa (see below). 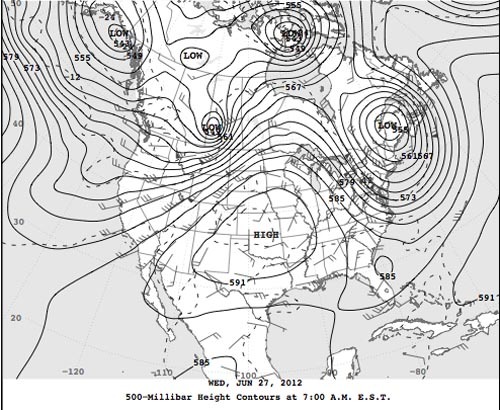 You can see the troughs and ridges on this chart (trough lines indicated by dashes). Now much of the time the troughs and ridges move through (generally from the west to the east) and we get "normal" weather... sunny days interuupted by cloudy, rainy ones (or snowy in winter). The figure show such a situation. But sometimes the atmosphere "locks up", with a ridges or troughs staying in one location and increasing in amplitude. This locking up is often termed blocking. Blocking is not well understood, sometimes we can figure out why it is happening, but often we are clueless. In fact, blocking can happen quite naturally as part of the non-linear, complex physics of the atmosphere. 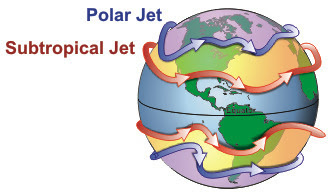 Many of the extreme weather situations are associated with such locking of the atmosphere. Why has the middle of the U.S. experienced apersistent heat/drought and the West Coast has been cool and wet? You guessed it--the upper flow pattern has been locked in a configuration of a ridge over the central U.S. and troughs along the coasts. 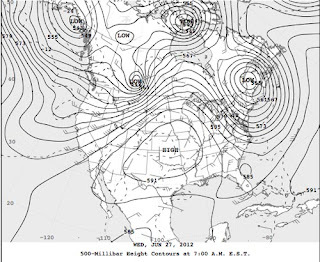 Here is a sample of the pattern from late June. Take a look at the departure of the average temperatures from normal for June and the last two weeks when this configuration has been in place. You see that some of the differences from normal (the anomalies) exceed 9F!. These are very large anomalies, and FAR exceed that signal that thescientific community believes might be associated with human-caused global warming over the past 50 years (perhaps 1 F). You see how this is like the Japan tsunami? Sure, global warming might be making things a bit warmer, but these major weather/climate events are clearly associated with natural variability. Global warming...and particularly warming caused by humans...plays a VERY minor role. This conclusion, for the current heat wve and other events like the Russian heat wave, is supported by a number of scientific reports, including some very well known scientists at NOAA (an example here). Now, some of you may ask, could global warming due to human greenhouse gas emission be increasing the amplitude and "locking" of the upper waves? There is absolutely no evidence of this. Some climate model studies, suggest the opposite....that blocking and weather anomalies might DECLINE as the earth warms (see article here that discusses this issue). So the weather might get LESS extreme. Other models indicate a slight increase in blocking. There is little doubt the earth is warming from a combination of natural and human-induced effects and that the number of high temperature records are being broken as a result (and as result of urbanizaton and poor instrument siting). But the evidence suggests that the big weather/climate events have little to do with global warming. Reading the media and scanning the press releases of environmental advocacy groups, you would not come to these conclusions. Some organizations, like Climate Central and extremists like Bill McGibben, hype every major weather anomaly as proof of the profound effects of human-induced global warming. They ask you to "connect the dots" but are playing a very unhealthy role in this issue by providing false information. The trouble is that the media feeds upon this stuff...and my local paper..the Seattle Times....is one of the worst. Even more embarrassing, national pundits with little climate or meteorological knowledge...like Paul Krugman...are parroting these unproven ideas. The psychology of those hyping extremes is worthy of study and analysis...but I suspect the reasons are clear. Many are convinced, as they should be, that mankind will have a large impact on the climate of the planet by the end of the century because of our enhancement of greenhouse gases. Plus, acidification of the oceans. They believe by hyping the relatively small impacts during the past few decades that they can motivate people to act. A lie for a good cause. And yes there is the human side--folks love attention and feeling important...and the media is happy to provide this for those telling tall tales of huge current impacts. I know that a few will jump on me about not mentioning the deceptions of the "other side." And they are legion. There is whole climate change denial lobby... funded by energy firms, the Koch brothers, and others... and supported by large group of folks that believe that conservatism and conservation are not compatible, saying that greenhouse gas impacts are an unproven theory, and that natural variability is the only game in town. They are wrong. The science is clear: human-induced warming will be a profoundly serious issue for our civilisation by the end of the century. And the polititicizaiton of this scientifc issue has become very unproductive. If you believe in the seriousness of global warming in the future, it is essential to stick to the truth. Over-the-top claims--which are easily provable to be false or which will fail to materialize in the near future-- simply undermine the credibility of the science. Mankind can only make the right decisions if they know the truth...and the uncertainties, and there are two groups in this conversation that are doing much to prevent the public from understanding the nature of this serious problem.